The cover contest is now closed, but you’re still welcome to comment. We ended up choosing C, and we really appreciate everyone’s opinion. Wish we could make all of you happy… Congrats to Barry Standley for winning two free ebooks! Jeremy Walker is a blogger with Reformation 21, a pastor in West Sussex, England, and a writer who has clearly marinated his heart and soul in Scripture and the works of the Puritans. He has also written a wonderful little book for us that together we have decided to call Anchored in Grace: Fixed Truths for Humble Faith. It’s coming out in June (there was supposed to be a May book but getting this website in shape threw us off track a little), and we could use your help finalizing the cover. Here are the three leading candidates, in quick mockup form, using watermarked (no pun intended) images. While you’re here, you might like to get a sense of what this book will be like. So feel free to take a look at the draft introduction below, complete with British spellings (for now). Or visit the book page, where you can also preorder. In his great treatment of spiritual warfare, The Christian in Complete Armour, the Puritan author William Gurnall speaks of what he calls “catechize-points.” These, he says, are “truths necessary to be known and believed.”[i] The truths upon which I wish to focus in this short book provide us with a stunning display of grace. They are truths which with Christians need to be thoroughly acquainted, truths with which pastors must thoroughly acquaint the people whom they serve. These are the paths to walk so that you do not miss your way to heaven, nor fail to honour the Lord God along the way. These are the anchor points of the faith that mature Christians need to point out to the generations following us. These are spiritual realities to reckon with. These are the gospel verities that must be defended against the errors and heresies that repeatedly threaten to undermine or overwhelm them, either by force or by fraud. These are central truths. They cannot be pushed to one side or downplayed without restricting our views of God and twisting our views of self. They are determinative, in large measure, for our views of Christian experience, life, duty and joy. They help to define our gospel witness as the church of Jesus Christ. Get these wrong and so much else will be immediately and persistently skewed. These are humbling truths. They strip away all the boasting to which proud and rebellious man is inclined. With searing honesty they make us face the facts about our own sinful hearts, our spiritual need and our utter dependence on the mercies and favours of God acting freely and graciously in accordance with all his glorious character and infinite being. They are truths that necessarily empty us of self before they fill us with Christ. These are saving truths. These things are the ground of our hope. Fail to reckon with these things, and there is no deliverance for our souls and bodies. Again, there is a holy progression and a divine logic at work. Like a sick man, we must acknowledge the disease and accept the diagnosis in order to pursue the physician and obtain the medicine. With regard to our souls, we will not flee to Christ as Saviour until we are brought to acknowledge the salvation that we need as found in him alone. Then, and only then, do we run to him and hide ourselves in him and find all our joy. These are comforting truths. Here the soul—however stained or troubled in itself, however weak and feeble we know ourselves to be or fear ourselves to be, whatever challenges and obstacles we face, whatever trials and temptations lie before us—finds all that it will ever need. Here and here only we can rest in peace. Finally, these are God-glorifying truths. They exalt God in Christ, they make much of him, they draw attention to his person and they shed light upon his work. Here his being and his doing are made manifest. Nowhere outside of salvation through the Lamb do we find such a high and clear revelation of who God is and what God is like. Here the glory of God shines in his grace as nowhere else, prompting lives of earnest service and songs of ardent praise. My intention is simply to survey some of these fundamental truths—God’s display of his grace—in order that we might feel their sweet force for ourselves. In each instance, I will take what might be called an ‘epitomising text’—a short portion of God’s Word which encapsulates something of the truth in question. I hope to demonstrate that it is by no means the only Scripture that proves the point, and so to bring to bear something of the whole counsel of God upon the matter. My great concern is both to explain and to apply these truths. My intention is not first to be polemical, but I trust that as we see these truths springing from the pages of our Bibles it will be persuasive, to direct us and confirm us and encourage us in the things that God has made known. We must see that these are not dead letters, but spiritual realities that ought to grip our souls and govern our thoughts and deeds. In so doing, I trust we shall be instructed, humbled, saved and comforted, and bring glory and honour to the God of our salvation as he holds before us in his word a display of his grace in Christ Jesus, his Son and our Saviour. [i] William Gurnall, The Christian in Complete Armour, 166. I prefer C. It is simple which depicts humility. I’m not fond of B because of the green mirky water and A depicts a story in itself. It made me think of mystery and horror fiction; the far away ship on the surface. What lurks beneath? Just my thoughts. I’m looking forward to reading the book! Thanks, Lee! Appreciate the perspective. It’s between A or C.
B just seems to lose the aesthetics with the green water and close up on the ship. A, for me, keeps the focus on the anchor and brought to my mind the lyrics from How He Loves, “if His grace is an ocean we’re all sinking”. Thanks, Breton. Sounds like you’d go with A or C, with A maybe a little bit in the lead. i like A or C with the look of the anchor in water. They grabbed my attention better. Another vote for A or C. Maybe there’s a trend forming. Thanks, Amy. I like B myself. I like that it actually shows the ship that is being anchored. An anchor chain by itself seems a little too conceptual, and not “real’ enough. Just my opinion. For what it’s worth, my 6 year old also liked B too! My order of preference: C, A, and then B. There is less visual distraction with the chain by itself and doesn’t draw the eye away from the title. Nice simple, comprehensive answer. Thanks, Persis! C- the line of the chain intersecting with the black author line looks much better. Thanks, Laura! C seems to be quite popular. Honestly, none of them. With a word like “Anchored” in the title, I expect to see something chunky with big flukes on it. It’s not “Chained in Grace”, I guess is what I’m getting after. But, if I had to choose one of the 3, I would go with A. It doesn’t include the anchor itself, but the vessel is in the background. It shows that there is something connected to the chain, that it’s grounded ins something. As others said, the green water in B is a bit of a turn-off. And with C, it’s just a chain stretching through the water. What’s it attached to? What’s it there for? It almost has a horizontal perspective, like a chain blocking the mouth of a harbor or an inlet, instead of being an anchor chain. Thanks, Matt! You’ve broken new ground in this conversation, and it’s helpful. I think C is the best because according to your criteria- “if a cover doesn’t work at 2 inches high it doesn’t work at all,” C is the clearest on my computer. Another vote for C….thanks, Andrew. Now that’s an interesting way to put it, Peter…thanks much. I would choose C first and A second. The blue colour of C is bright and appealing like grace, but the colour of A is dull. The chain in C is strong and draws the eye to the book and up to the title. Sure looks like C is pulling ahead. Thanks, Colin. Definitely C! At thumbnail size you can easily still tell it’s a hefty chain tied to some type of anchor and the water is clear with an attractive color. The bubbles add to the effect of making it immediately recognizable, like God’s Grace is in reality. A with out a doubt. Brighter & more interesting. Thanks, Mez. Appreciate your work across the pond! A. Because it has a ship, clear water and a heavy chain probably tied to an anchor. Sounds good, Sonny. Thanks much. A. “A” best captures the anchor theme in my mind with the visible boat. While I like the bright colour of “C” , the chain in that picture doesn’t turn my thoughts to ‘anchor’ like “A” does. We’re developing an interesting set of A vs. C comments here… Thank you, Daniel. C. It connects the reader to the book with the perspective of being on or next to the anchor, but is not as busy as A. B does not draw the reader in. And Anne votes for simplicity… Thanks so much! I like A or C (which seems to be the consensus), but think A is a bit better. With a ship clearly in the picture, the idea of an anchor comes to my mind quickly. C is just a chain in water, so the idea of an anchor doesn’t match up as well. Hi, Ashley. And you’re putting a little more weight onto the A side of the scale. We appreciate it! Prefer C. It just isn’t distracting. Also then tension on the anchor shows that the anchor is needed. I choose A. The dark blue communicates a seriousness or weight to the meaning of the book. I like the perspective of the boat too. Choice B’s colors remind me of games on a summer day, and feels carefree- not so serious. I like C, but mainly just because of the color (my favorite) but not because it communicates a specific making. I would go with C. The boat images in A and B seem to take away from the overall image. C with it’s chain in deep water makes the anchor image clear without being overly detailed. Seems more powerful to me. OK, Jolene. This is a very interesting A vs. C debate. A feels heavy in a negative way, seems to lack hope, like being chained underwater to drown rather than being anchored savingly. B doesn’t really work as well compositionally with the black bars. The elements don’t seem to integrate well and the angle seems to lack a purposeful point of view. C feels positive because of the color and texture, and the angle of the chain both interacts well with the black linear elements and also makes for a more dynamic compositional space. It seems the most hopeful and powerful. I prefer C — please enter me in the draw! You’re entered, Peter! Thanks for weighing in. Like pretty much everyone else, I think B is a dud. C is more visually appealing, but a little lacking… something. A is OK, but not right either. Instead of seeing the boat, maybe seeing the chain connected to the anchor, wedged into a rock. Of course, that might be a bit too much on the nose. However it goes, sound’s like a book I want to read. Thanks for your thoughts, Noah. We’re glad you’re excited about the book. We certainly are! I’m joining the C gang. Another vote for C. Thanks, Nathan. I prefer A. I like the murkiness of it, maybe the mystery, and from that perspective, we’re looking up from the grace end of things. Good points. Thanks for voting. I echo Breton’s remarks about B’s unappealing aesthetic appearance; the image has so much color going on that, at first, I wasn’t even sure what I was looking at. I’ve also never seen such green water so that made the image even more confusing. C looks too simplistic and, as Ashley already stated, all that comes to my mind when I look at it is a chain in the water; there seems to be very little correspondence between the title and the image. The color is also too bright. When put together, the color and simplicity would make me think the book was cheaply made and the cover poorly designed. A is the only choice that strikes me as being a cover on a book that would draw my attention; I honestly wouldn’t even think twice about the other two. The darker and more muted colors suggest weightiness and give the image a sense of mystery. The dimness of the water also draws my attention to the starkness and the solidity of the chain attached to the anchor, which made me think that about the fact that being “anchored in grace” means being grounded in the Gospel even when the waters are murky and life is hard. I also like the fact that the image depicts the ship rather than the anchor, because the emphasis then falls on being “anchored” while simultaneously suggesting that the book will explore what it means to be anchored from the perspective of grace itself. I like theological books that “get under the surface” of the Scriptures and don’t simply offer man-centered suggestions regarding spiritual matters. The fact that the image situates the viewer deep beneath the water’s surface subtly implies that “Anchored in Grace” is this kind of book. Very thoughtful, Eric. Thank you! Immediately I was drawn to “C”. The color is RICH like grace – and the downward thrust of the anchor’s chain points to the depth of this richness. In this life the stabilizing reality of grace is so desperately needed! Amen, Allen. And thanks for your thoughts! Thanks for joining in, Beth! ‘A’ gets my first vote, with ‘C’ a close second, and ‘D’ (Matt suggested an anchor shot) a possible third. I like seeing the ship on the surface and the idea that we sometimes don’t really see where our anchor sits. ‘C’ is clear and I like the color, but other than reminding me of an anchor chain, that’s the only thing that connects it with the possibility of a ship or a anchor. As another comment suggested, it’s not ‘chained in grace’ so that’s why A was my first choice. Support for D seems to be growing! 🙂 Thanks, Doug. My initial visual reaction was ‘C’. However, given the title and subject matter I think ‘A’ is the best choice. It is clearly an ‘anchor’ scene, but the cover is not crystal clear. Grace may not be crystal clear to all, and perhaps reading this little book will bring clarity and anchored understanding. Thank you, Jim. We appreciate your comments. Either C or A. I like the clear picture of the anchor chain on C, but in A I like the fact that you can follow the anchor chain up and see the boat above. A and C definitely seem to be the favorites. Thanks, Alan. I prefer C. Really expected to see an anchor in the picture, not just the chain. My eye was immediately drawn to “B” because of the color variations in the cover itself, and because it stands out from the other monochromatic blues. In a sea of book covers, “B” would stand out visually compared with the the solid blues. “B” also has more of the sense of the title without my brain having to work so hard to process the relationship between the title and the image. 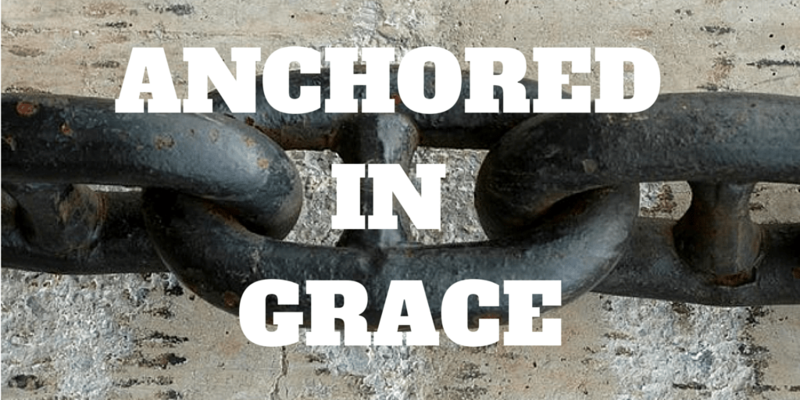 With that said, I’m on board with Matt’s comment that none of the 3 really grab me, and since the title is not “Chained in Grace” but “Anchored in Grace”, my synapses where expecting something more “anchor-y”. Anchor-y…what a great word! Another vote for B. Thanks, Scott. I like option C because it’s the clearest at that size. I like A, too, but I had to look at it twice to understand what it was. Option C was quicker to grasp at a glance. Thank you, Jennifer. Good to know. My vote is for C. It’s sharp & simple. We know the chain is attached to an anchor because of the title of the book. A & B are just a little too cluttered for my taste. C seems to be the favorite. Thanks, Nate. I like C. It is straightforward, attention grabbing and simple. Thanks, Lee! You’re obviously not alone in that opinion! I like (A) the best. The boat floating all alone up there at the water surface gives greater significance to the chain. Thanks, Stephen. For those who like A, it does seem to be the larger-context factor you pointed out. I definitely prefer A. First, B just doesn’t grab me aesthetically; that shade of green with the off-white ship looks rather drab and dirty, which aren’t adjectives remotely associated with grace! Both A and C have a more refreshing feel. Second, the vibrant blue of option C reminds me of a pool party or something else that’s fun, colorful, and free-flowing. The underwater effect does remind me of the sheer depths of God’s grace, but I feel that option A does that too. Also, I agree with Ashley that a chain without a ship doesn’t bring to mind “anchor” as quickly. Third, option A really captures the weightiness and awe of grace well. The blue is calm and makes me think of the peace found in being anchored in God. And I like that we can see the ship. I’m excited to read the book! Chalk up one more for A. Glad you’re looking forward to the book, Chris! I like the simplicity and brightness of C. Second place would have to go to A but would like it much better if it was brighter. Simple, bright C — thanks, Ruth! I love A – The chain extending into the blue water …. I vote for “C” because I think it’s simple, contrast (in colors) and still conveys the truth desired. I prefer C. It’s simple, the color is pleasing, and the chain is clear even on a small screen as the background provides good contrast. One more for C! Thanks, Robert. I like (A) the best out of the three but I think I would like to see a cover with some kind of an anchor better. C. Clean, simple, straight forward, Just drew me immediately. Definitely go with C – but flip the image, the chain will then be more balanced with the title design with a stronger triangular framing. I agree that an anchor should’ve been featured in some way, but of the three options, “C” is definitely my favorite. The blue is beautiful and eye-catching, and the chain is prominently portrayed. Thank you, Josh. We appreciate it. I prefer C. It’s cleaner and simpler, but conveys the idea in a powerful way. A. It’s the only one that looks truly “anchored” to me. I also like the implication of “unfathomable” grace from the angle. Another for A. Thanks, Peter. I think C is the most aesthetically pleasing. I appreciate how A has a bit more included than just the chain, but it’s entirely too dark. B is okay, but not as compelling as C. Thanks! Thank you, Deb. You’re entered in the drawing. C. The chain is big and bold and solid. Makes me think of strength and security, which is the very picture of God’s grace. B looks weak, and A (as someone said) looks more like a novel. Looking forward to the text. Glad you’re looking forward to it, Scott Thanks for voting. I like the clarity of colour and image of “C”. Photo A – looking forward to the contents as well as the eventual cover! With the ship in the background it’s clearly understood to be an anchor attached to the bottom of the chain. The colour of the image is darker, invoking the storms of life, but the angle of the image draws our eyes up to the title (where the water is lighter), and so up to the Giver of grace. Support for A continues. 🙂 Thanks! I prefer C and the 2nd choice would be A. Thank you, Marguerite. C then A seems to be the most popular opinions. A is better and then B would be good if the water was changed to Blue. You’re not the first to not like green water. 🙂 Thanks for voting! Prefers cover C. Though no ship nor anchor appears, the title explains what the chain is all about. A much cleaner and brighter feel. No matter how strong the current of life pulls us, like an anchored chain, the grace of God holds us steady. Clean and bright is good! Thanks Joseph. A’s too murky, and B’s too rusty and the green water is offputting though I liked the general concept if only it were a bit shinier and clearer water. C’s clearer and brighter, so of the 3 I’d go for it. Another vote against green water. 🙂 Thanks, Peter! I vote for B. It shows what is above water, making me feel I can breathe more easily. Interesting perspective, Henry. Thank you. I prefer C. I believe the anchor is more of a focus on this cover than the others. I vote for image A. I feel it is the most visually appealing and captures the title really well. I prefer C, due to simplicity. A and B just seem to have a ltitle to much going on. Simplicity is good. Thanks, Brian. I like B. Out of the 3, I think it brings across the idea and importance of anchoring to me most clearly. C gets my vote. That image reminds me of my scuba-diving days when I was so deep (and the sky was overcast and the water was murky from algae) that I could not see either the lake’s surface or the underside of the boat, but I could see objects within, say, 5 to 8 feet. Coming across an anchor’s chain in such conditions helps a diver to avoid panic and to know where to ascend. The bubbles in the photo suggest a diver coming up alongside such a chain. Very interesting, Barry. Thanks for your thoughts. I prefer A and C.
A. It’s the most clear representation of an anchor and what it does. B is ugly and C, though interesting, just looks like a chain. This cover is the most striking and distinctive (all that rich blue), and enables the quickes connection between cover art and book title. Connection is what we’re looking for. Thanks for your thoughts. I like C. I like the shade of blue, that the anchor is underwater, and close-up. The water “bubbles” make it look as if you are there. C is the best choice. Another mention of the bubbles. Thank you, Zacarias. Our preference is A! It gives the best sense of anchored in our opinion. It’s simple, clean and conveys depth. Thank you, Shawn. One more for C.
I prefer C. I like the color and the bubbles! Another vote for bubbles! Thanks, Emily. I’m sorry but I think C is too plain. Simple is good, but its just a chain in water, it isn’t attached to a boat/anchor so to me its just a random chain in the sea, sorry! I also found it interesting that none of them featured an actual anchor. I love C-visually makes the point! I like C best. A is OK, B takes a minute to figure out what is going on. Another for C. Thanks, Daniel. The most eye-catching is C. But I would agree with the comment of none of them. I really like the cover photo best with the 3-link chain on stone. Strong message with inability to be moved, versus in water. And another vote for D. 🙂 Thanks for your comments, Jan.
A, most eye-pleasing, others are a tad too cheesy at first glance, if not just amateur looking.